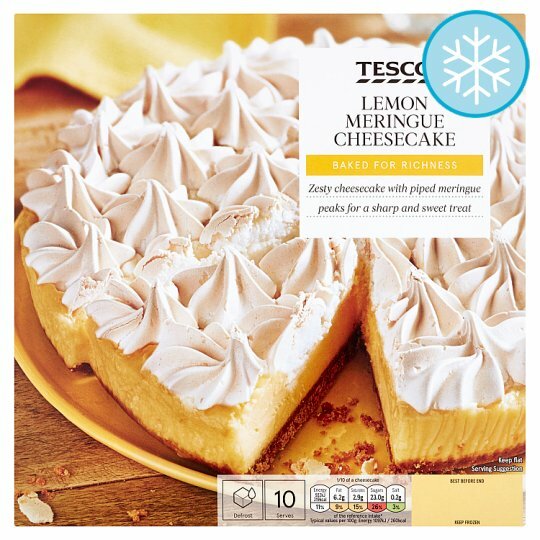 Baked lemon flavoured cheesecake on a digestive biscuit base, topped with meringue swirls. INGREDIENTS: Low Fat Hard Cheese (Milk), Meringue (16%)(Sugar, Water, Dried Egg White, Invert Sugar Syrup, Maize Starch, Acidity Regulator (Citric Acid), Thickeners (Sodium Alginate, Calcium Alginate)), Wheat Flour, Sugar, Pasteurised Egg, Cream (Milk), Vegetable Margarine(Palm Oil, Water, Rapeseed Oil, Emulsifier (Mono- and Di-Glycerides of Fatty Acids), Acidity Regulator (Citric Acid)), Lemon Sauce (3%)(Glucose Syrup, Invert Sugar Syrup, Concentrated Lemon Juice, Sugar, Flavouring, Maize Starch), Brown Sugar, Maize Starch, Invert Sugar Syrup, Raising Agents (Sodium Bicarbonate, Ammonium Bicarbonate), Emulsifier (Mono- and Di-Glycerides of Fatty Acids). Alternatively defrost thoroughly for a minimum of 3 hours at room temperature.